Our successes in helping veterans is thanks entirely to people like you. When you click and view sponsor ads, purchase from our store, or make a direct donation to one of the many wonderful programs we highlight and support, you produce results like these. Thank you helping America's veterans in need! America's veterans have served their country with honor, gained skills and experience in the field, and are a national treasure. That makes it even more painful for those who get home and fall through the cracks, struggling to acclimate to civilian life, trying to find good jobs, and all too often, fighting the debilitating effects of Post-Traumatic Stress Disorder. Studies show that companion animals significantly improve mental and physical health, reducing stress, depression, and anxiety. Pets & Vets gives both shelter dogs and veterans a second chance at health, friendship, and happiness. 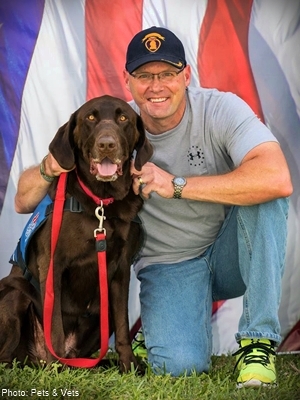 How do dogs help veterans cope with PTSD? Professional trainers rehabilitate dogs facing euthanasia, teach them good manners and skills, and carefully match them with veterans like Sergeant Christopher. U.S. Army Staff Sergeant Christopher served in Iraq, conducting a multitude of missions. He was severely injured by shrapnel during a firefight when an RPG hit the door of his Humvee. Today he has mobility issues, vertigo from a traumatic brain injury, and anxiety and depression from Post-Traumatic Stress Disorder. PTSD is an ever-present challenge for a significant proportion of veterans from multiple service eras. The Veterans Administration has information about veterans with PTSD resulting from the Vietnam War, the Gulf War, and Operations Iraqi Freedom and Enduring Freedom. The effects of PTSD don't always get better with time; it is vital for affected veterans to reach out for help and treatment. That help can come in many different forms. A service dog named Papi graduated from training for the Patriot PAWS Service Dogs program by Pets & Vets. He quickly found his veteran in Chris, who reports, "With Papi, I don't have to watch my back as much anymore because he now has it. Papi doesn't sleep much at night; he watches me and makes sure I wake up out of my nightmares. When he helps me get up in the morning, I am already much happier and in a better mood. I am not so bitter anymore. Thank you just isn't enough." Do more to help Pets & Vets, and other programs supported by GreaterGood and The Veterans Site! On any given night, there may be more than tens of thousands of American veterans sleeping in shelters and on the streets. Community groups are hampered by lack of space and funding, so veterans don't have many places to turn. Worse, nearly four million veterans and their families don't have enough to eat during the year. 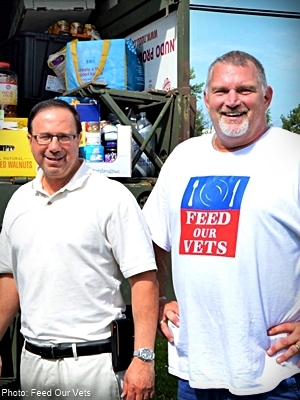 Feed Our Vets is on a mission to provide free food assistance to veterans and their families. Can meals make a lasting difference for veterans in need? Survival starts with the basics: food, shelter, and safety. Providing food lets veterans like Andrea devote time, energy, and resources to getting back on their feet. Andrea is a veteran of the Army National Guard; she served in Operation Iraqi Freedom and Operation Enduring Freedom. Back at home, she was struggling to find a job, and going through a rough time. After trying to find help, she reached out to Feed Our Vets. "I need help with my electric bill. I have reached out to many organizations, and they are unable to assist. I have a six-year-old child. It is cold in the area of Columbia County, and I do not want to be without electricity. In addition, I do not have enough funds to provide food in the home. I'm not currently employed. However, I'm searching and placing applications." "I do not know where to turn or whom to ask for help. I'm trying everything to keep a roof over our heads and food in our stomachs. I'm trying to keep the faith and believe that there is an organization out there that can help us out. Please help us." Fortunately, Feed Our Vets had been funded by a grant through GreaterGood.org, and they were able to help Andrea's family. Do more to help Feed Our Vets, and other programs supported by GreaterGood and The Veterans Site!